Little Guy Neck Tie, Age Nb - 3 Yrs. Variety Of Colors. Cake Smash Tie, 1st Birthday. 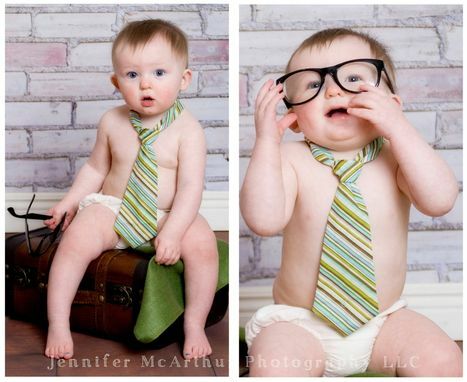 These are neck ties made for that little guy in your life. The neck tie is made and attached to a cloth neck band of the same material. They have a velcro closure that will come un-attached if caught and pulled on hard enough, so they are safe. They make a great 1-yr photo prop for a cake smashing event. Select your option from photo's above. Last 2 photos are more fabric options. Please allow 3-5 business days to make bow ties with these fabrics as they are not ready to ship. Photo 3: shamrock, shamrock gold fleck, music notes, giraffe, white/black circles, white multi dots. Photo 4: Blue leopard, bright multi stripe, blue stripe/dots, grey/purple diamonds, red diamond, blue diamond. These can be made for older boys. Please contact me for pricing and sizes.